La villa si trova nella parte più settentrionale dell'isola di Corfù nel villaggio di Platonas, a 35 km dalla città di Corfù, a 3 km dalla spiaggia sabbiosa Roda e dall'atmosfera cosmopolita con ristoranti, taverne, bar e discoteche che incantano i visitatori. La villa è circondata da villaggi incontaminati e enormi uliveti, aranceti e limoneti. La villa gode di privacy nei suoi 2500 mq non sulla strada principale. È idilliaco per gli ospiti che apprezzano la semplicità più perfetta in un ambiente veramente greco. L'interno è decorato con materiali tradizionali e riflette la buona cura e l'amore per l'isola. Al piano superiore troverete una camera da letto matrimoniale, una camera da letto doppia e un bagno di lusso. Il soggiorno con il camino, una cucina completamente attrezzata e un WC si trovano al piano terra. Tutte le aree hanno il loro balcone ombreggiato. Lovely house and beautiful garden. A very relaxing place to stay and excellent base to explore from. Would definitely go back to this house. Met by the exceptionally friendly owners on arrival and had no reason to contact them throughout our stay. A lovely small villa in a tranquil setting but only about 10 minutes to the coast and resort towns. It is under 1 hour to Corfu town by car. 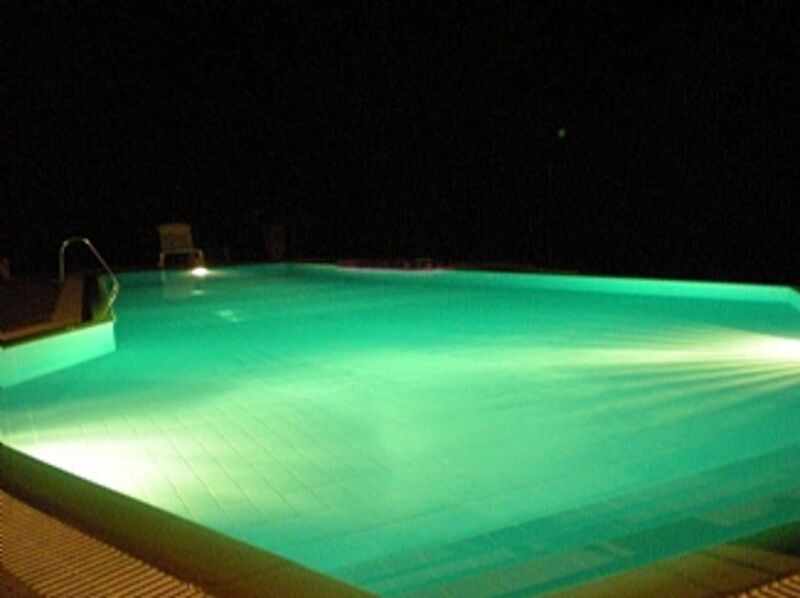 The star of the villa is the wonderful pool and of course the gardens. There is an excellent village shop a 5 minute walk away that stocks most things. We were so impressed with this rental from start to finish. The owner, Amaryllis, has been professional and helpful from start to finish. Her parents were there to meet us when we arrived and again were incredibly helpful and kind. The house itself is comfortable and is decorated in a very traditional Corfiot style. Everything we needed was at hand. The absolute highlight are the gardens with the massive and beautifully clean pool, masses of fruit trees and lovely flowers. There are tables and chairs everywhere so there's always somewhere to eat that's in the shade. The huge barbecue is next to an arbour of grape vines and is simply stunning. Around the corner from the villa is a fab little supermarket and the nearest beach at Roda is great - shallow and safe for kids, with loungers and umbrellas to rent which even have a waiter service for a cheeky beer! Overall, in years of renting properties abroad, this is simply the best villa we've ever had. It's highly recommended and we'll definitely be back. The Nymphes Estate exceeded our expectations and the photographs do not do it the justice that the Villa, pool and grounds deserve. The privacy is nigh on complete with surrounding trees and shrubs providing seclusion. The grounds are well kept and very pretty with colour in abundance. The pool is large and very clean. The villa is furnished in traditional style and the beds are very comfortable. Roda is a short drive or 40 min walk away and has all you need for an enjoyable holiday particularly if you are a family. Larger supermarkets are only a 5 min drive away. Our holiday was that enjoyable there is every chance we will return in the not too distant future. Our first time here and we had a fantastic time. The villa is great- loads of space, clean, A/c in bedrooms (phew) and the pool is fabulous! We went with our two sons - 19 and 15 - and we all had a fully relaxing holiday in the heat (hit 54 degrees on my sunlounger one day!) with the pool being our saviour. Wi-Fi works well - need to be closer to the villa and router but so what? !Hermioni will do anything for you and Roda is a lovely town- not too big and not too small. Everyone is very friendly and there are great restaurants and some decent bars too. Great sunsets and views to Albania- magical some evenings.Fully recommend this villa and Hermioni!! Hope to return one day. Booking Notes: Advance deposit of 30% of total amount is required to validate booking. Timing of payments within 1 month. Changeover Day: If there is availability arrival and departure times can change.